What drives the world? 1866 marks the start of the electrification of industry. The discovery of the dynamo-electric principle has brought about greater changes to the way our society lives than practically any other scientific breakthrough. By inventing the dynamo machine, not only did Werner von Siemens help bring about the advent of electrical machinery, he was also instrumental in accelerating and facilitating industrial processes. Seen from the perspective of society, this completely changed accepted concepts of time and mobility. 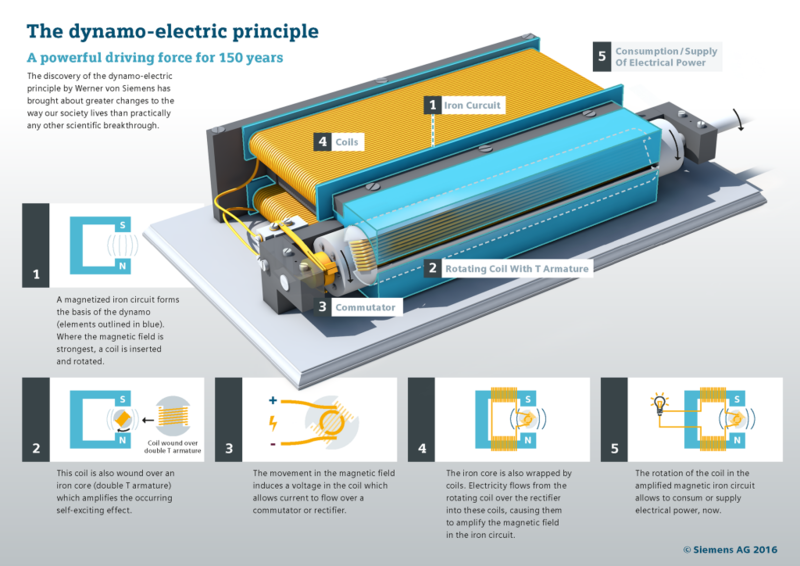 Werner von Siemens discovered the dynamo-electric principle 150 years ago. This technical revolution forms the basis for wide-ranging innovations. Today, Siemens supplies drives for almost every application. 150 years ago, Werner von Siemens discovered the dynamo-electric principle and developed the dynamo machine which allowed "any amount of mechanical energy to be converted into electrical energy to be used for electric lighting, metallurgical processes, power transmission and perhaps future purposes of which we are not yet aware" (Werner von Siemens). This innovation laid the foundation for the electrification of the world, helped bring about the advent of electrical machinery and had a lasting and fundamental impact on the speed of industrial processes. This completely changed accepted concepts of time and mobility for the whole of society.